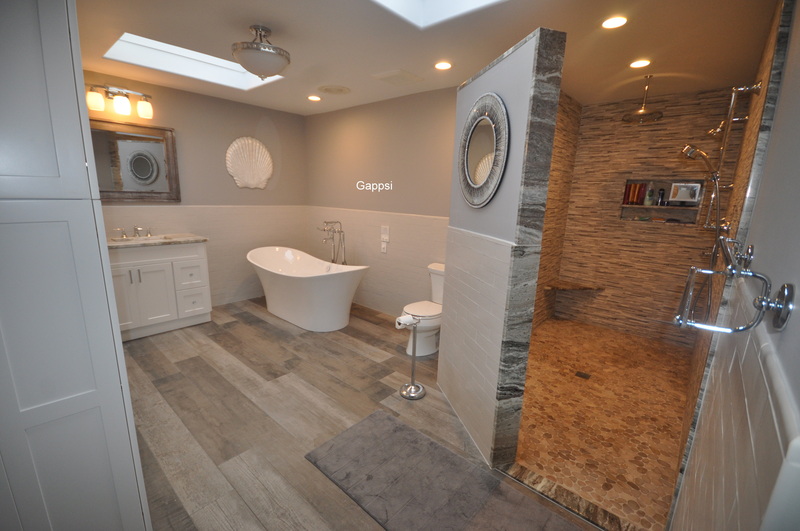 This elegant bathroom in The Moorings gated community in East Islip, Suffolk County, Long Island, NY was designed and built by Gappsi. We used porcelain tile on the shower walls. The bathroom vanity, niche, corner bench and wall edges on the entry to the shower are all granite. Annabelle 69 inch acrylic, free standing, white soaking tub provides a soothing experience with Rook Lever Handle Kit Pair in Chrome made by Brizio. Shower body, thermal valve, 3 control valves with a luxurious rain shower head from ceiling, wall shower head and hand shower head faucets in chrome are all made by Grohe.